This extension includes two options that will change the product page design. The first one is Two column product page. It will show product images on the right column and the rest on the left. The second option is Boxed Price. It will show the price in a nice box. 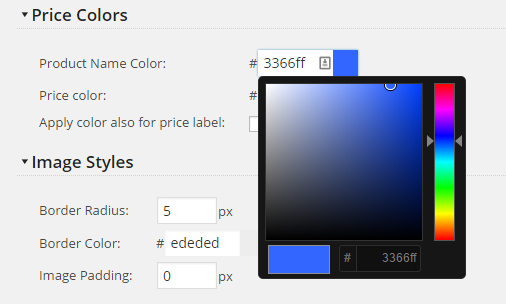 You can easily change product name and price colors with a robust color picker. It allows to set any color from the color palette. Adjust the settings to your needs, click save.